“Soaring 175 feet above the Potomac River waterfront at National Harbor, The Capital Wheel, set to debut in May 2014, will join a growing number of large-scale observation wheels around the globe as an iconic, world-class attraction. 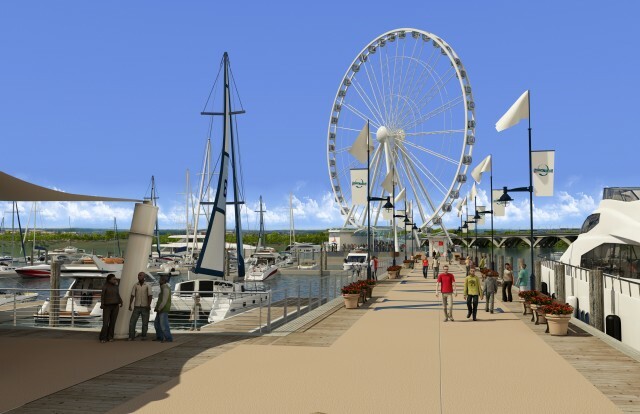 From its dynamic location at the end of a pier overlooking the river, The Capital Wheel will offer riders a spectacular view of the Nation’s Capital “from a new perspective,” according to National Harbor developer Peterson Companies. Sights visible from The Capital Wheel include the White House and Capitol, the National Mall, Arlington Cemetery and the lush parklands throughout the DC-Maryland-Virginia region. With its 42 closed, climate-controlled gondolas, each seating eight, The Capital Wheel will operate year-round, as do observation wheels in other locales, where they have boosted economic development and prestige. The Capital Wheel is expected to attract 600,000 – 800,000 visitors annually. The London Eye quickly became the United Kingdom’s most popular paid tourist attraction, averaging 10,000 visitors daily and some 3.75 million annually. A popular location for films and TV shows, it also hosts events as diverse as corporate launches, weddings and fashion shoots.